Kasai is back in New York! 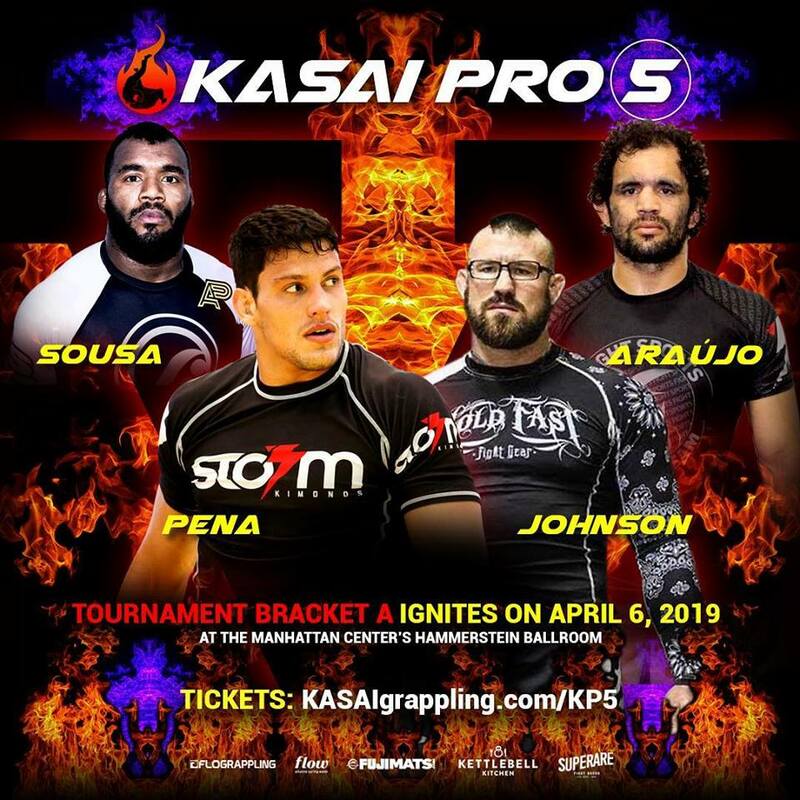 Kasai Pro returns for number 5 with a star studded lineup with some of the biggest names in Jiu-Jitsu today including: Craig Jones, Felipe Pena, Romulo Barral, Dante Leon, and rising star Jon “Thor” Blank. The event begins with a stacked undercard followed by the 8-man round robin tournament to see who the best light heavyweight in the world is. In between the tournament rounds their are 3 featured superfights that will keep everyone on the edge of their seats! 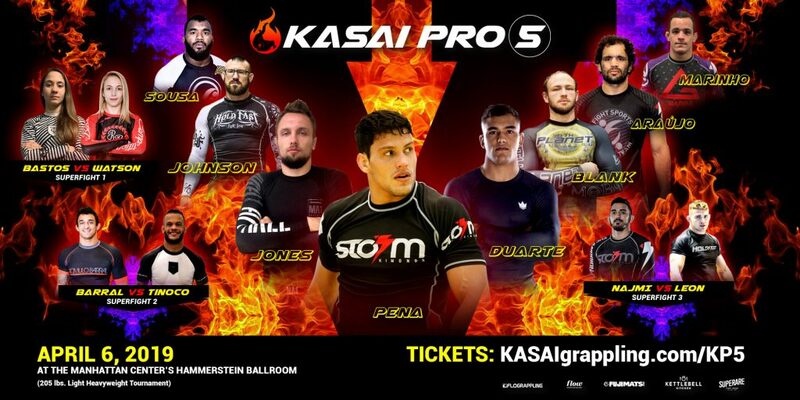 Kasai Pro 5 takes place at The Manhattan Center’s Hammerstein Ballroom located at 311 W 34th St, New York, NY 10001. Doors open at 5:30pm ET. Undercard begins 6pm ET. Main card beings 8pm ET. Group A: Felipe Pena, Jackson Sousa, Tex Johnson, and Valdir Araujo. Felipe Pena vs. Valdir Araujo: Felipe Pena winner by points (2-1). Tex Johnson vs. Jackson Souza: Tex Johnson winner by Heel Hook. Felipe Pena vs. Jackson Souza: Felipe Pena winner by points (3-0). Valdir Araujo vs. Jackson Souza: Jackson Souza winner by points (5-1). Felipe Pena vs. Tex Johnson: Tex Johnson winner by Heel Hook. Group B: Craig Jones, Jon Blank, Kaynan Duarte, and Pedro Marinho. 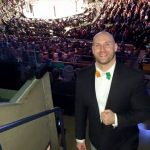 Kayan Duarte vs. Jon Blank: Kayan Duarte winner by points (9-0). Kayan Duarte vs. Pedro Marinho: Kayan Duarte winner by points (11-1). Craig Jones vs. Jon Blank: Craig Jones winner by Rear Naked Choke. Jon Blank vs. Pedro Marinho: Jon Blank winner by Armbar. 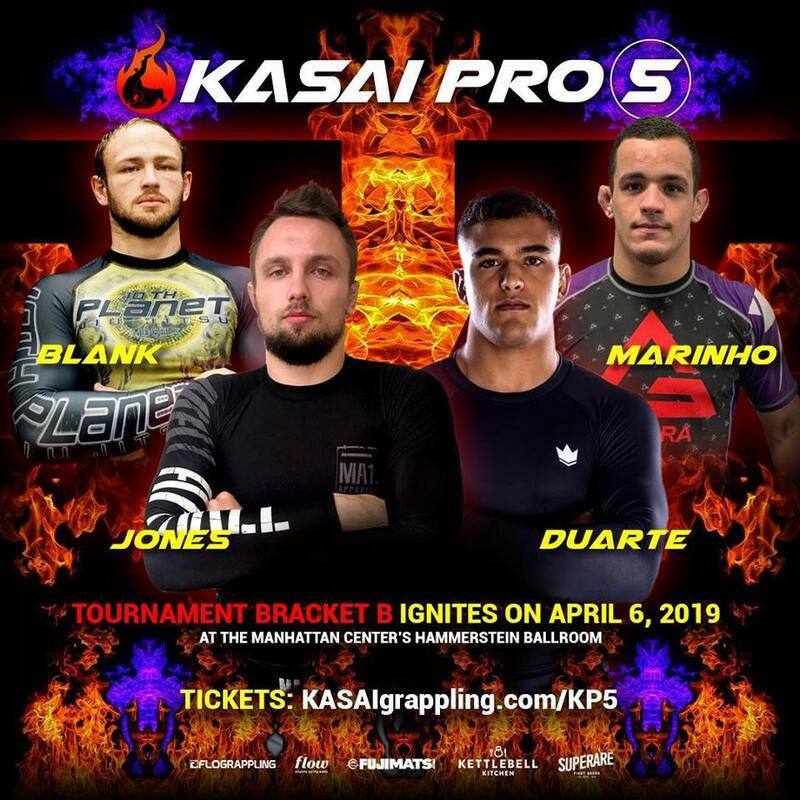 Craig Jones vs. Kayan Duarte: Kayan Duarte winner by Rear Naked Choke. Craig Jones vs. Jackson Souza: Craig Jones winner Ankle Lock. Tex Johnson vs. Kayan Duarte: Winner by points (3-1) and Champion Kayan Duarte. Romulo Barral (Gracie Barra) vs. Marcos Tinoco (Marcelo Garcia) 189 lbs: Marcos Tinoco by points (4-1). Dante Leon (GF Team) vs. Edwin Najmi (Gracie Barra) 175lbs: Dante Leon winner by Rear Naked Choke. Mayssa Bastos (GF Team) vs. Fion Watson (Notorious MMA) 115lbs: Mayssa Bastos winner by Rear Naked Choke. Chelsea Mapa (TRAINING GROUNDS) vs. Christina Pinto (SILVER FOX BJJ) 115lbs: Chelsea Mapa winner by decision. Steven Ramos (ESSENTIAL) vs. Albruce Touaev (BRUNSWICK BJJ) 170lbs: Steven Ramos winner by points (7-0). Alex Nemeth (STRATEGIC MMA) vs. Justin Primrose (OAMA) 200lbs. Gi: Justin Primrose winner by Gi Choke From The Back. Laura Griffith (RGA TEAM) vs. Nathalia Santoro (RGA) 140lbs: Nathalia Santoro winner by Guillotine. Jon Potts (Monster MMA) vs. Konstantino Chioutakos (FAZ FORCA TEAM) 185lbs: Konstantino Chioutakos winner by points (12-3). Sean Yadimarco (SAVARESE) vs. Mathaus Anderson (GREGOR GRACIE) 170lbs. Gi: Mathaus Anderson winner by Armbar Inside The Triangle. Rey De Leon (10thP NYC) vs. Tony Bergamo (MUSHIN NYC) 135lbs: Rey De Leon winner by points (8-2). Freddy Martinez (SHAOLIN BJJ) vs. Nick Fiore (RGA) 165lbs: Nick Fiore winner by points (7-0). Vinicius Ferreira (ALLIANCE) vs. Sergio Vilas (RGA) 205lbs: Sergio Vilas winner by points (3-2) in OT. Athos Miranda (MG) vs. Pierre Olivier-Leclerc (TRISTAR) 170lbs: Atos Mirands winner by points (2-0) in OT. Matteo Martinez vs. Stanley Rosa (BAMMA) 185lbs: Stanley Rosa winner by points (3-2). Carlos Rosado (GB LI) vs. Kurt Chase Patrick (10TH P. FAIRFIELD) 155lbs: Carlos Rosado winner by points (10-0).